Horses At Home/Friends Must Part is this weeks book. It is actually 2 short stories combined into one volume, I have never seen them printed separately. It was first published in 1954. The first picture on the right is the first edition and the second picture to the right is an Collins Pony Library edition, but there is not a blurb on those. I like the Collins Pony Library editions, they seem to have nice illustrations on the cover. The first edition is illustrated by Sheila Rose, but the Collins Pony Library edition is not illustrated. When Nicholas's and Clare's aunt was suddenly rushed into hospitial, everyone wanted to know what was to happen to her two famous show jumpers. "But it would be so easy, and Aunt couldn't afford to pay all that money to have them kept in a livery stable. Please let us have them. Please. We'll be dreadfully careful." Horses At Home is the first story: it tells the story of Nicholas and Clare's famous showjumping Aunt (called Gay), who due to an illness, means that they are left to care for them. They quite often find themselves out of control (overhorsed springs to mind here), which leads to some incidents. Fortunately nothing deadly serious happens, and they get their reward when Aunt Gay is much better. 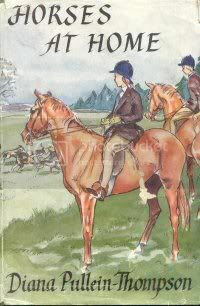 To me, this has elements of Pat Smythe's (the showjumper) real life, and to a certain extent her books, but it is still a lovely story. Friends Must Part is the second: it tells about Andy and her relationship with her pony and the people who live across the road. She has a pony called Peppermint, but is later replaced with a pony called Gingersnap. Unfortunately when she goes to buy Gingersnap her sister, Brandysnap is for sale. The people across the road chose Brandysnap, when in reality Andy wanted her first. There is a feud over this, which isnt helped with the 2 ponies wanting to be with each other. Fortunately, this is solved towards the end of the book. I personally think that Horses At Home is the better story: perhaps why this is first. But they are both great stories and one of the easiest to get into. It is a pleasant light book which should appeal to everyone: however being 2 short stories there are some bits missing, and could be better if it was 2 normal length books. Still this is one of my favourite Diana books. I actually have a copy of this sitting on the top of my to-be-catalogued pile, so must now read it. I haven't read it for a while, but thought the Friends Must Part bit had echoes of Riding with the Lyntons. I wonder how the stories started? Did they have a former life as short (even shorter) stories? I dont know how they started, but it is interesting that you mention about Riding With The Lyntons, which is this week's book. In thinking about it, it did remind in some way of "Friends Must Part". I think that they always meant to be together: I guess Diana was trying a new method of writing. Both Christine and Josephine have written anthologies/compilations, I guess Diana didnt want to go down that route, and that is the nearest she got to it. What a lot of people seem to forget is that the P-Ts wrote a lot of articles and short stories for Pony magazines and various annuals (including Pony Magazine's annuals). It could be the case that Diana wrote this for one of these, and for some reason the editors didnt like them, and she thought that they were extremely good, so instead she approached Collins, and put it into a book.